Sirak Okbazion, 14. Clarky Stevenson, 15, Paris Bruce. 16. Hearing the names of these three teens should give each and every Winnipegger pause. They weren’t just teenagers involved in street gangs. They also represent, respectfully, a decade-long grim lineage of ‘child soldiers’ who were influenced or preyed upon by older gang members to do their dirty work. These kids are also dead today. And it’s not right. It reflects a failure of our society that they died so young and so violently. Beyond that, you can draw a kind of map (and in fact, I have) tracing the lineage of street gang-related mayhem that resulted as spillover from the separate killings of these three city teens. Action prompts reaction: It’s not just a law of physics. It’s also part of the street gang ethos. You hit us. We hit you. I’ll give you a very brief breakdown. Sirak’s homicide was committed when he was 14 in 2004 by the West Broadway-area B-Side gang in response to one of their members being shot at. It spawned fare more than just greater violent conflict between Sirak’s newly-founded gang, the Mad Cowz and the B-Siders. (Both factions are still with us today, just noting). Sirak’s death led to internal strife within the Mad Cowz, which saw the creation of the African Mafia in protest of how Sirak’s death was (or was not) avenged. That strife led directly to multiple shootings, firebombings and other violent mayhem. Worse yet, it directly influenced the death of innocent Phil Haiart, who was gunned down by AM members Corey Spence (15 at the time) and Jeff Cansanay as he simply crossed a West End street. Cansanay, the triggerman goaded by Spence to ‘shoot, shoot,’ was aiming at two Mad Cowz members, but missed. The resulting fallout from Haiart’s murder became a kind of chromosome in Winnipeg’s DNA. How the political and police response shook out to the 17-year-old’s death is part of our essential makeup as a city. From Haiart, we caught a close-up glimpse of an awful truth: Kids are being used by gangs, and kids, by virtue of their ages, are unpredictable. Maybe I could be next, people wondered. Stevenson’s stabbing in 2011 in the North End has likely caused more bad blood between entrenched street gangs – he was an Indian Posse associate – than one might believe. Well liked by many and known for being ferociously fearless, sources tell me Stevenson was on track to taking a place in the IP’s gang hierarchy. So, when it just so happened he wound up stabbed to death, allegedly by suspects linked to the MOB gang, violence spilled over between the two groups in waves, and to some degree continues to this day. Soon after, innocent David Michael Vincett, was shot by James Sinclair – just 14 – on Boyd Avenue. “I did it pretty much because of what happened to my friend,” Sinclair told police. Sinclair was an IP associate who mistook Vincett for a member of the MOB on a darkened street, chasing after him with a .357 Magnum and gunning him down with a single shot to the head. 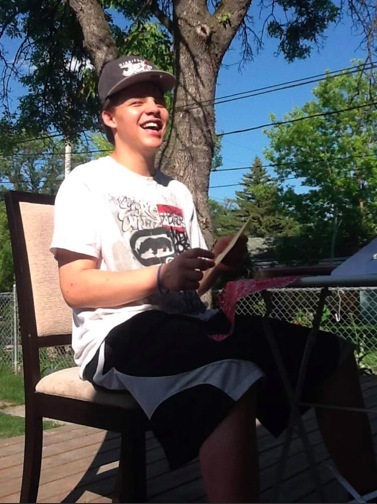 While one teen, Steven Johnston, was acquitted earlier this year of stabbing Stevenson to death (but wound up back in custody soon after for a triple-stabbing), another faces trial for second-degree murder. Today, we finally learned the sad fate that befell Paris Bruce, 16. Bruce, aligned with the Mob Squad – a splinter faction of the MOB – was led into a plot hatched by an older gang member to take over an Indian Posse crack house. Just weeks before Bruce was beaten to death by IP members, the gang superior, Joshua Jeffs, who got Bruce mixed up in the plot that would claim his life, was viciously attacked by four teen IP members with a hatchet and machete for being part of a group that attacked their Boyd Avenue hangout by surprise. Jeffs, according to prosecutors, also enlisted another teen and an 11-year-old boy to try and take over the Redwood Avenue crack shack. Bruce, maybe not comprehending fully what he was getting himself into, tried to run when IP guys caught on to what the Mob Squad was trying to do. He wound up beaten and stabbed to death. It’s no mistake that the Crown used the words “young soldiers” to describe Bruce, the other teen and the 11-year-old and their position within their gang. Despite how ugly the tactic is, it should be more than patently obvious by now that older gang members are well-aware of the benefits of using younger guys to do the dirty work. To them, the ‘kids’ are expendable – and, let there be no doubt, in great supply – even if they’re dying off or being sent packing to jail for a time as a result of their involvement in the gang underworld. I’ll repeat: The fact that any kid winds up in a gang is a signifier to us that something is wrong with our society. Whether they wind up there because of poverty, addictions, for protection or for a sense of belonging, seeing our youth wind up being used by criminal factions they way they are should be nothing short of alarming to us. But recruitment continues, relatively unabated, and has done so in Winnipeg for a long time now. There are many, many more examples I could call upon that I’ve seen in recent years. What’s to be done about it, I can’t offer a solution other than to say every child needs a baseline of normality in their lives in order to have a chance at success over the long-term. What I am sure of — and it should be pretty clear by now if you’ve gotten this far — is that “child soldiers,” “young soldiers,” or whatever you want to call them, are a blight not just on the gangs they’re enlisted in, but on us as a society as a whole. We should be shocked and outraged by the brutal, violent deaths of people in our city who have barely lived. I get the sense we’re generally just resigned to the fact that this happens to some of our youth. And it’s wrong.